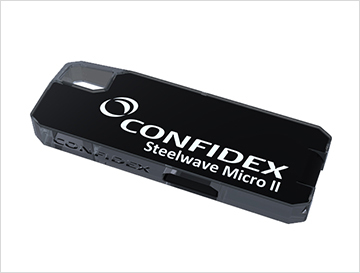 Confidex Steelwave Micro II™ is a small-sized UHF all-surface tag, which for its size provides unique performance. Confidex Steelwave Micro II™ peak performance is achieved when tag is attached on-metal. However, it can be very well used on any surface or even hanging. Versatile attachment options make this small product a real All-Around indoor asset tag and enables new possibilities in ICT and electronics tracking. Confidex Steelwave Micro II™ is a small-sized UHF all-surface tag, which for its size provides unique performance. Confidex Steelwave Micro II™ peak performance is achieved when tag is attached on-metal. However, it can be very well used on any surface or even hanging. Versatile attachment options make this small product a real All-Around indoor asset tag and enables new possibilities in ICT and electronics tracking. On and off metal tag. Additionally, short time exposure resistant against sulfuric acid. Acetone and sodium hydroxide should be avoided.